Over 26 flavors and an unlimited number of combination to choose from. The Sweet Tooth has been making people smile for over 100 years with a time honored family recipe. Our specialties include hand made caramel and Chicago Style popcorn, retro candies, ice cream, shaved ice and chocolate dipped specialties. A wide variety of Retro Candy from times gone by. Handmade Chocolates by Grimaldi of Grand Haven, Mi. Buttery caramels, and rolled truffles, turtles and more. Our caramel corn is made using "Grandpa's recipe" from 1906. The Chicago Style corn is a blend of our homemade double cheddar and caramel corn. It's a perfect mixture of salts and sweet flavors. Not too sweet, and not too heavy. Stop by today to get your sample of our famous Caramel or Chicago Style popcorn. Or give us a call and we'll have ti delivered to you. Impress your recipient with a unique gift basket from The Sweet Tooth! Our large gift basket includes one large bag of Chicago Style Popcorn, one large bag of Caramel Corn, two regular bags of flavored popcorn in your choice. 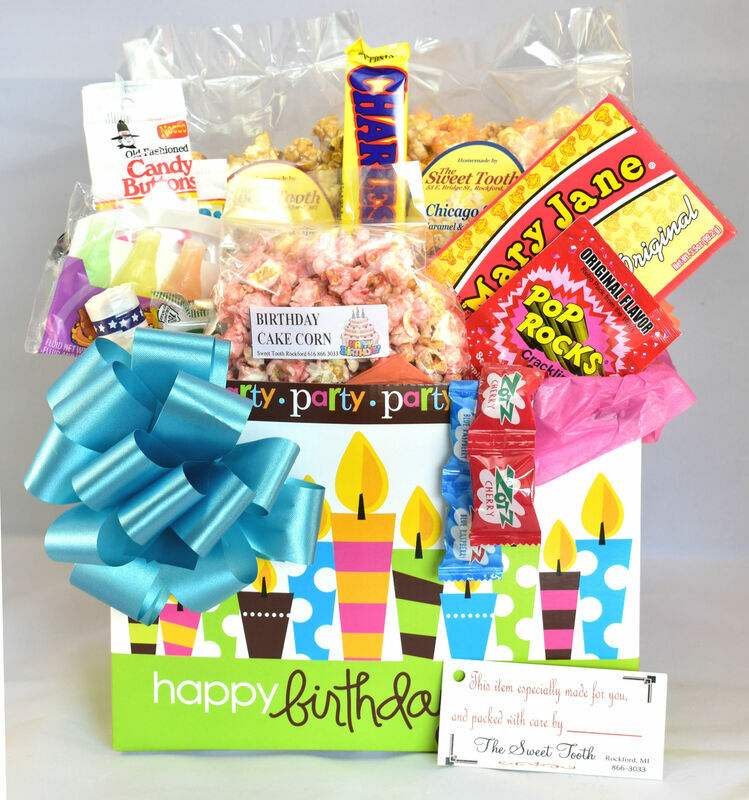 The specialty baskets are made up of one large Chicago Style Popcorn, one large Caramel Corn, two regular bags of flavored popcorn of your choice, plus a small assortment of retro candies*. The regular gift basket includes two regular size bags of popcorn in your choice of flavors. Just for fun. Gag gifts and candies.